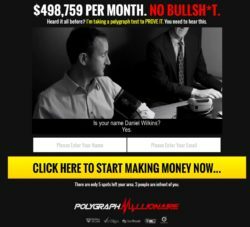 This review of Polygraph Millionaire contains proofs about this program being a scam. It is presented by Daniel Wilkins. Wilkins pretends to be the creator of a binary options trading system that can make you hundreds of thousands of dollars per month. His Polygraph Millionaire system allegedly hasn’t had a single losing trade for a long time. And you can get Polygraph Millionaire for free, because becoming a millionaire is free nowadays, right? Does all that we said about this system sound familiar? It indeed does, because Polygraph Millionaire is in fact a rebranded version of the Lie Detector Millionaire scam. It is exactly the same program, scammers just changed the name. So if you want to see the complete review of this scam, click the link above. In the meantime this same actor also played the main role role in the Blazing Trader scam under the name of Johan Strand. Let’s just recap what is Polygraph Millionaire about. Wilkins is a fictitious character played by an actor. Everything he says in the presentation is a lie, all the trading and bank account statements he shows in the video are fake. The same applies to any positive testimonials or reviews you might find about Polygraph Millionaire. Scammers have even used the same trading software for Polygraph Millionaire. What’s more, this is an app widely used by scammers for different scams. Check the picture to see some other programs that use the exact same software. Only the colors and logos change. 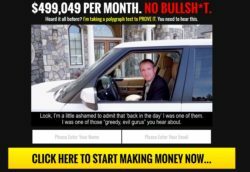 Polygraph Millionaire works the exact same way as all the other scam. The only purpose of this program is to make you sign up with a certain broker and to make you send money to this broker. Because this is what scammers are getting paid for, they are affiliated with some brokers, they get money for referring new depositing traders. So they make up all sorts of lies just to convince you to open an account through their software with their brokers. But if you do it and let Polygraph Millionaire trade with your deposit, you will lose it. The software loses money in trading, we have a lot of feedback about it from real users. 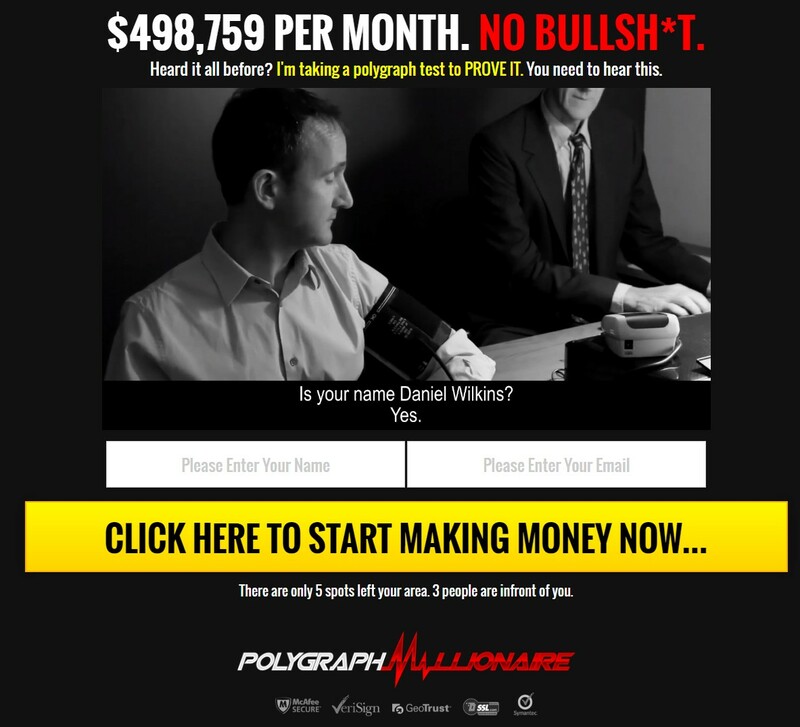 Polygraph Millionaire is a scam that is made to lose your money. They won’t let you try it unless you deposit with their broker, so stay away from it. Forget about free money making system, the real path to profits with binary options leads through learning and testing on a demo account. You can get it for free.